Are you considering using a sweepstakes or contest for an upcoming social media marketing campaign? Ever wonder exactly how a social sweepstakes ties in with the idea of “viral” marketing? In this article, I’ll analyze the concepts affecting a social media “viral sweepstakes” and how marketers can and (potentially) should take advantage. What Exactly Is the Meaning of the Term Viral? Marketers use the term viral to describe media proliferation in two different contexts. On one hand, viral can describe “massive engagement;” i.e., when droves of people sign up for a particularly enticing offer. Alternatively, “views” can go viral, which occurs when people share a brand campaign with others many times over. More people respond to an advertisement (customer acquisition). This online "Band of Buds" campaign from Budweiser has two viral aspects: participants recruit friends to participate and share their group's activity with others. Reason for sharing: can rely on either non-monetary (“This video is so cool that you just have to see it”) or monetary (“Share this and get a coupon”) incentives. What is shared: two most common options are evidence of participation (“Hi friends, I just entered this contest”) and actual content. Content can be brand-created or user-created. 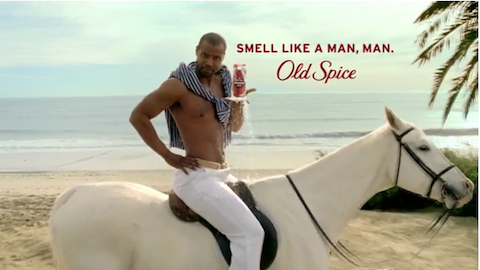 The Old Spice "Smell Like a Man" videos are an excellent example of brand-created content that spread virally via non-monetary incentives. Mode of sharing: can be either passive (post to a participant’s own profile for others to see) or active (participant sends direct messages to friends). Sharing outlet: various outlets exist for both passive (e.g., Twitter/Facebook status update) and active (e.g., direct mobile/email messaging) sharing. 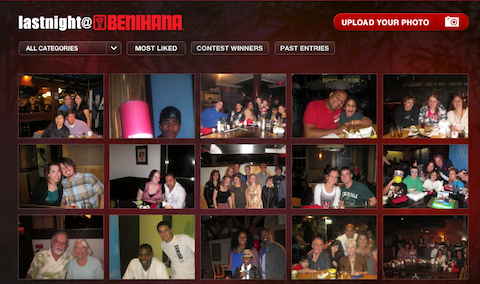 This campaign from Benihana uses a $100 gift card to encourage both active and passive sharing of user-created photos. As with most things in marketing, significant tradeoffs exist among the various viral approaches. Though cost-effective, driving sharing via non-monetary incentives is much more art than science. Sharing content spreads rich media, but risks being invasive. Passive sharing accesses a broader, albeit less interested, audience. Selecting a specific social network or distribution channel requires a comprehensive understanding of consumer communication preferences and available marketing resources. As described in a previous post about viral marketing, Using Social Media to Broadcast Mobile QR Codes, success ultimately comes down to execution. No one-size-fits-all solution exists, so developing a clear understanding of a campaign’s resources, customers and goals is crucial. Prior to running any social media sweepstakes campaign, marketers first should familiarize themselves with the conceptual and legal need-to-knows behind social media promotion. This will ensure that a sweepstakes has the proper foundation on which to build a viral component. 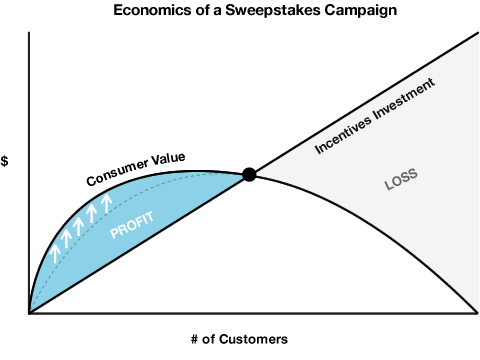 Viral components stem from the economics behind a standard sweepstakes. Breaking it down, consider that at its core a sweepstakes asks consumers to commit to a brand using an incentive as bait. 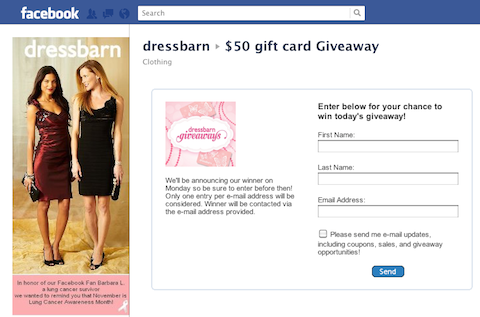 In this Facebook offer, dressbarn uses the chance to win a $50 gift card as bait for customers to provide their email addresses. Like fishing, additional bait for marketers (incentives) costs more money, but allows you to reel in more consumers. However, unlike bait fishing, each subsequent catch returns less value. Each subsequent consumer commits to a brand less out of a desire to spend money and more to redeem the incentive. In economics lingo, each incremental consumer returns lower and lower incremental value for the brand. Eventually, the incentive required to lure additional consumers exceeds the corresponding benefit to the brand. 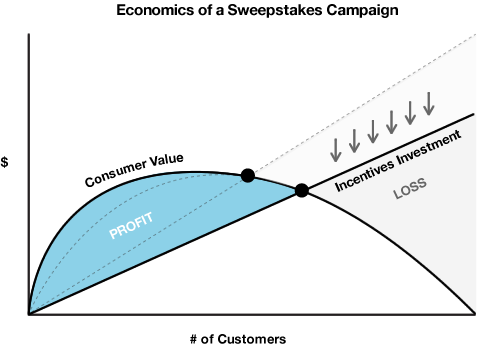 A marketer’s goal for a sweepstakes then is to find the point of inflection that maximizes value created at a given cost of incentives. The trick then is to choose a viral sweepstakes strategy that maximizes the value created from increased brand recognition, brand equity and customer acquisition. With a soft share, consumers receive a reminder that they should share with their friends and family. On one hand, this is the least invasive encouragement possible. On the other hand, only those truly impassioned consumers will be prompted to extend themselves on behalf of the brand. 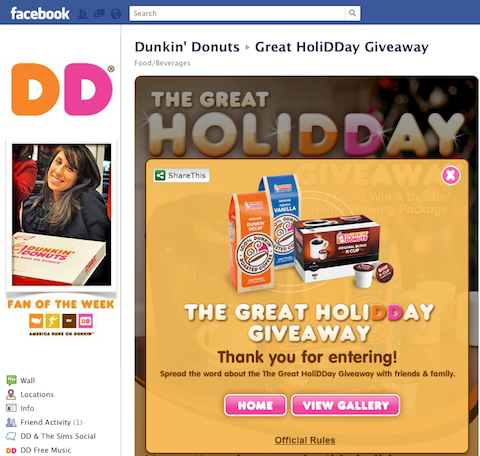 Dunkin Donuts uses a non-monetary incentive to encourage people to passively share evidence of participation via social share options. The direct share integrates the share call to action directly into the ad. The advantage here is that the share call to action takes on more of the character of the brand. 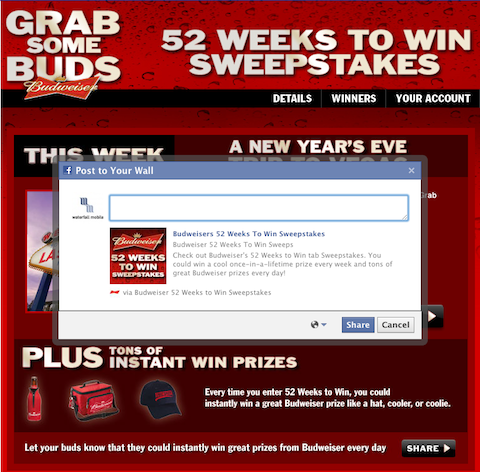 Budweiser uses a non-monetary incentive to encourage passive sharing of content via Facebook. With an incentivized share, brands put more responsibility on consumers to actively participate. The benefit is that consumers will go out of their way to recruit more participants. 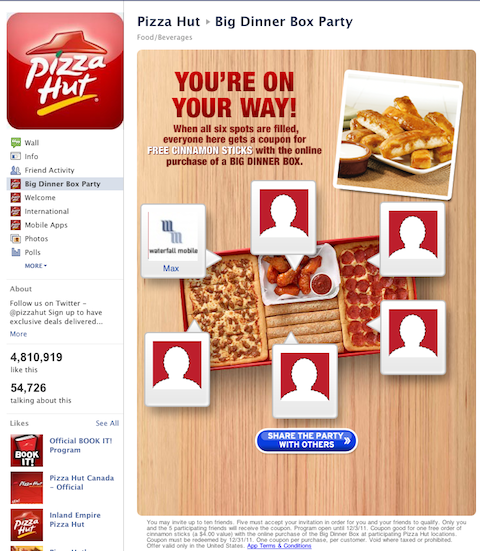 Pizza Hut uses a monetary incentive to push consumers to actively share content via Facebook and direct messaging. Putting these campaigns back into the context of our graph, you can see tradeoffs among the different strategies. The soft and direct shares rely on others to expand the profit bubble. The incentivized share takes an active role in expanding the profit bubble. The correct tactic depends on how actively engaged consumers are already (e.g., perhaps Budweiser feels that its audience is particularly motivated) and the incentive (e.g., free cinnamon sticks requires a bigger push than larger incentives). One other thing to note: the incentive to share for both the soft and direct shares actually decreases the original person’s chance of winning. In my mind, this is evidence of using technology for technology’s sake instead of with the end user in mind. Within the context of a brand running a sweepstakes, these designations are important because they can change over time. However, it’s only through the creation of a customer relationship management strategy that marketers can track these changes over time and use them to their advantage. 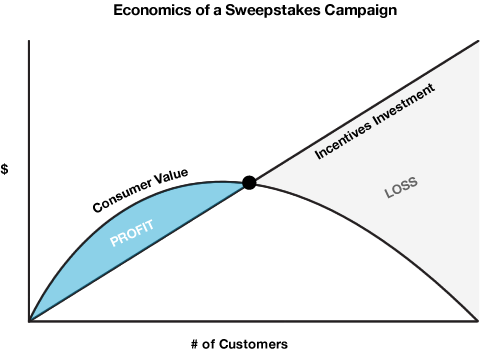 Sweepstakes are not the end-all be-all between brand and consumer; rather they are a launching pad or enthusiasm generator within the context of creating customer lifetime value over time. 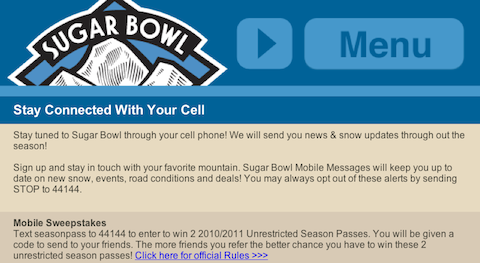 Participants in Sugar Bowl's sweepstakes can increase their chances of winning by referring others. Here is a case where each subsequent participant in the sweepstakes has a clear incentive to refer others without upsetting their own chances of winning. The tricky part is that such a contest requires a CRM system (in this case, customer mapped to mobile phone number) to track each new entrant as either organic or referred. On the positive side, you can now gain an understanding of various customer distinctions over time and reward those spectators or joiners who graduate toward the next level of brand engagement. Marketers can increase the benefits they receive from a sweepstakes campaign if they include a viral component, which can increase brand recognition, brand equity and customer acquisition. However, the benefits of viral components require a detailed understanding of a campaign’s goals, customers and resources. Ultimately, social media marketing has one goal: to use interactive messaging to maximize customer lifetime value over time. A sweepstakes provides an excellent means to bring on new customers and enrich the brand experience for current ones. Pushing a sweepstakes beyond a one-off engagement using CRM only increases the value to the brand. And the best part about viral marketing? Consumers do the marketing on behalf of the brand. A marketer’s dream realized. What do you think? What are other ways to use customer engagement to increase brand value? Have you found any other viral sweepstakes campaign to be particularly successful? Leave your questions and comments in the box below. Kane Russell is VP of marketing at Waterfall Mobile. Waterfall's mobile and social CRM platform, Msgme, provides businesses the means to build and monetize a mobile subscriber database.